"You've heard it a million times: Do more with less. It may be good business, but as budgets shrink and IT demands grow, you may start to wonder if the people who are saying ""do more with less"" think that it's a magical incantation. Run the servers without electricity! You've already taken basic cost-cutting steps and saved the easy money. You know that you need to dig deeper. But where should you start? What's killing your IT budget? The good news is that you're probably already staring right at the problem-it's just a matter of knowing what you're seeing and understanding what to do about it. Many of the largest IT budget problems can be traced back to five big money drains: 1. Storage expansion 2. System complexity 3. Hardware sprawl 4. Reliability and scalability 5. Compliance If any of this sounds familiar, you're not alone. 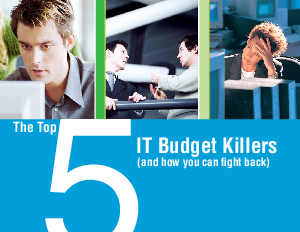 This e-book, provided by IBM, will introduce you to the five big IT budget killers - and some of the best ways to knock them out."